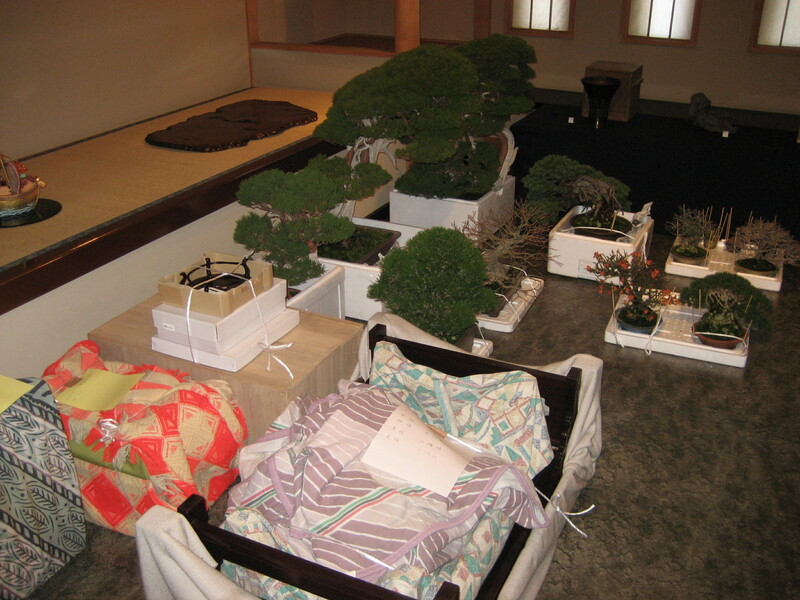 In the old days at the old museum, Kokufu-bound trees were kept and watered inside a temperature controlled room. Since changing location of the museum and garden from across the street to the grape orchard a few years ago, we have been housing Kokufu Bonsai in a small greenhouse constructed specially to keep the cold away. You may even think I’m crazy when I tell you this, but we even add an extra layer of bubble wrap on the interior to add a little extra insulation. Foliage will naturally change color in the hibernating period, especially Juniper, which tend to go bronze. Therefor, acting before the frost is essential, if you live in a cold environment and want to show a tree in the winter, doing what you can to keep the foliage vibrant and green is a must for conifer species. Also, take extra care after any repotting and keep those roots from freezing. Here at the nursery, we often use blankets, laying them gently over and around the container and root system. This helps too when a tree is root-bound or in an expensive or old container, better safe than sorry, so just wrap it up! Working on a Shinpaku for Kokufu during my second year. 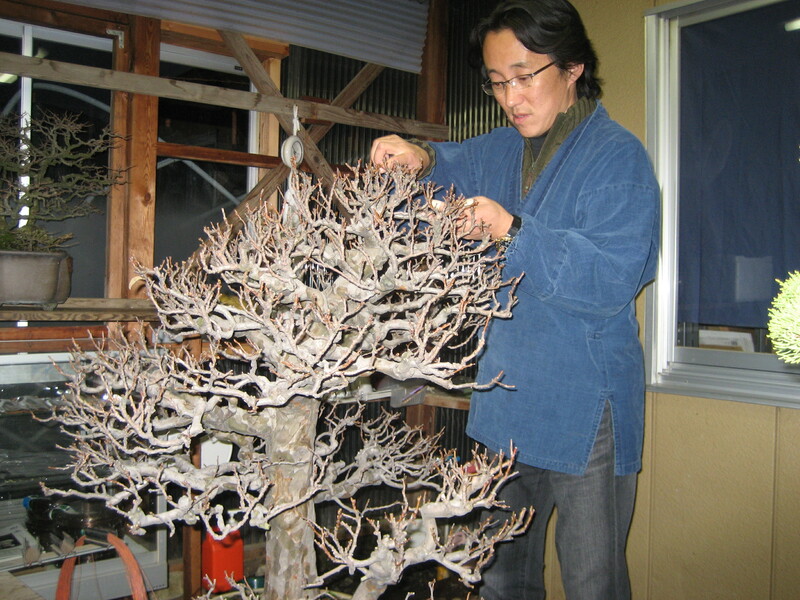 Oyakata touching up the silhouette on a nice Chinese Quince. Nothing says “Kokufu” like an old ramified Choujubai! These little guys work great in a Chuhin or Shohin display. They produce flowers non-stop throughout the year (less in winter.) It is important to take off the flower buds in summer to develop finer and stronger branching, flowers or fruit on trees in general sap energy and weaken the tree. 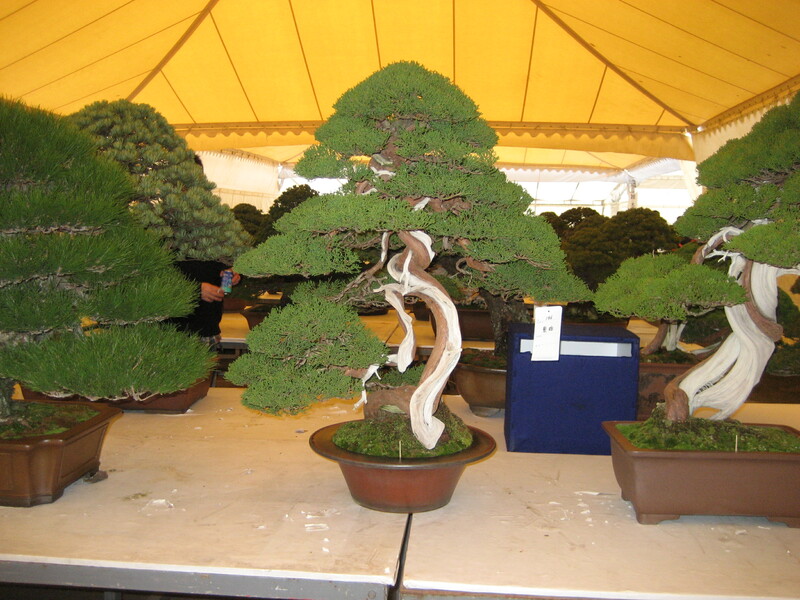 Here’s our little friend in a full 3-point display with a more impressive counterpart, this Black Pine went on to win a Kokufu award that year, I think it was #80 or 81. Going through these old photos makes me realize (or maybe worry is a better choice of word?) about our lack of Bonsai related elements in the U.S. 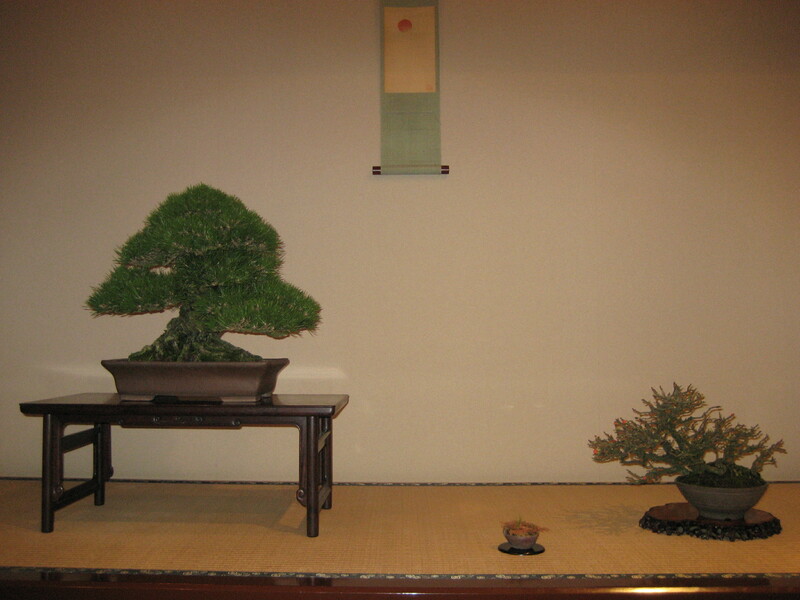 I can only speak for myself, but I think we could all use more stands and show-quality pots, this will only up the level of our Bonsai put on display. Not to say we need to import everything from Japan necessarily, but it would help. On the upside, I’ve been seeing a rise in quality with our native collected material on the West-side, and I am all too excited to get back to my home in Portland, OR and start taming then letting these magnificent beauties fill into and reveal their natural age and greatness. We have so much untapped potential, whereas good collected material in Japan is no longer a resource. We will come into our own with the right knowledge; I think the village will be the center of a thriving Bonsai community someday with people like Mike Hagedorn, (founder) Ryan Neil (cofounder) and hopefully myself when I complete my apprenticeship. Recognize? My first Kokufu work waiting to be judged at the Greenclub in Ueno. Well, its getting late, the dog’s at Tommy’s bar are barking and howling at the cold night and passerby. 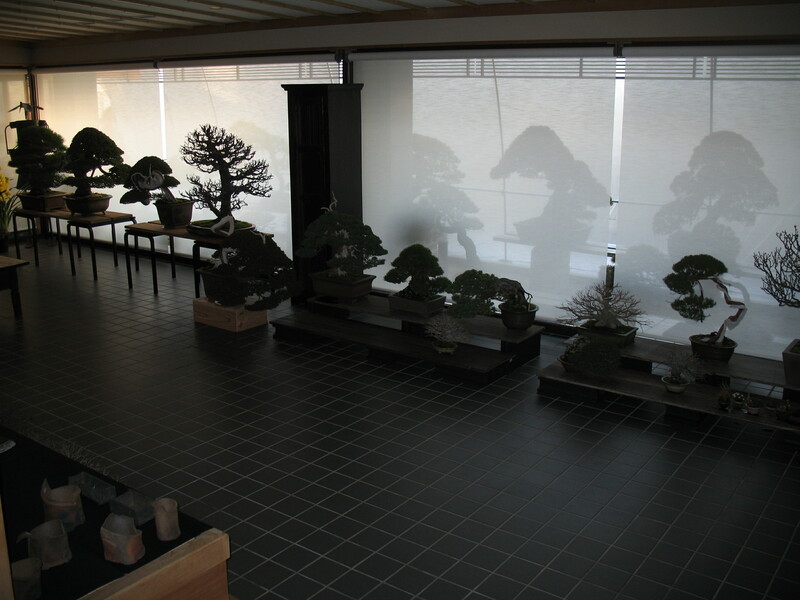 Repotted a few tree’s for Taikan-ten today, the show is coming up in a few days, think it starts on the 23rd. If you don’t get a chance to make it I’ll add some pics here shortly! 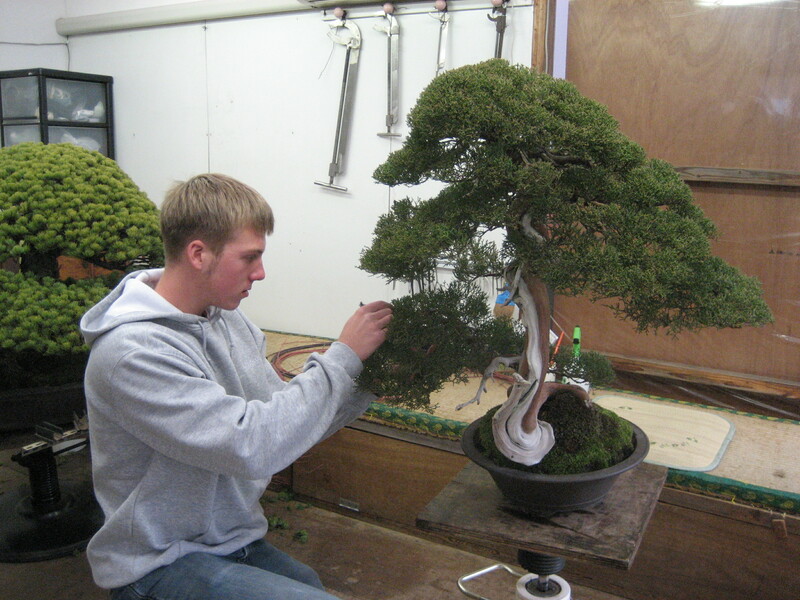 Don’t know yet which apprentice will get to go and who will be watching house, so be sure to check the blog of Tyler Sherrod (Tyler Sherrod Bonsai) or mine for updates in the coming week or two. Happy Thanksgiving, be sure to eat some extra helpings for Tyler and I, we could use it! This entry was posted in Uncategorized on November 18, 2012 by reelbonsai. 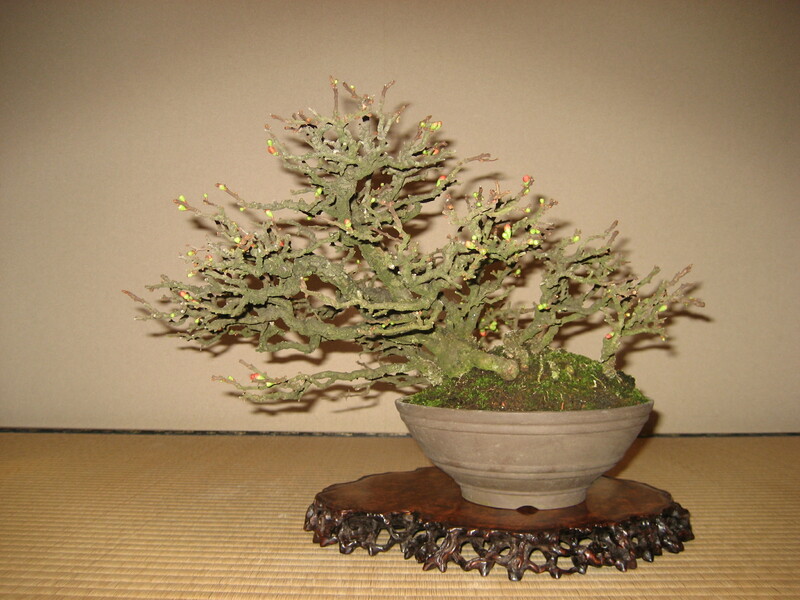 I love all the blogs of Bonsai aprentices. I hope I could be one. What an honor to be able work Kokufu! I am in the process of preparing a visit to Japan in Febuary to see the Kokufu. My Bonsai teacher who trained in Japan tells me my Bonsai life will not begin untill I go to the motherland and see the trees. I know you will be super busy, but I hope you will have 30 seconds to say hi and shake my hand. Keep it up as we are counting on you guys to help us step it up alot of notches here stateside and not just in the village. Elliot, I believe this concept of “the village” will be a nationwide endeavor, and I look forward to upping the level of the whole country! I hope we are able to encounter each other during the upcoming Kokufu show and would be honored to give you whatever time I have between running around. Thanks for your support and look forward to meeting you!